Yesterday was GREAT! We has lots of attention ALL DAY! There were treats & cuddles, and EVERYTHING! 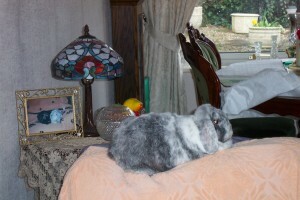 Flopsy Girl was so pleased she pee'd on the chair! Well I was out on the 2-foot's bed last night. It was great. I got away with peeing on it and pooing on it. All they did was change the bedding and go to bed without telling me off. I think I'll have to break my leg more often. You can get away with soo much! I would not go that far.... How is your leg now? Anyway I should see the vet next on Friday although I'm doing my best to get this splint off its really annoying.